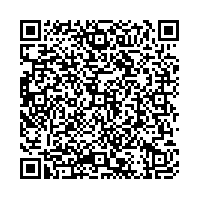 Scan this QR-Code with your mobile to add Bottom of the Hill to your address book! Do you really think there are enough stars here to rate the best of the best? Back in 2001 when dot-commies were ruining my city there was talk of them (along with a good portion of artists, musicians and the like) being forced out to Oakland, as they could not afford the rent anymore. Well all i can say, thank you for January 2001, the month it all crashed, as BOTH hasn't budged an inch since. Any band who has made or is making any impact plays here. If you haven't played here, you haven't played San Francisco quite yet. My favourite thing about BOTH was the sunday afternoon BBQ! As far as I know it still goes on and is around $7, starts late afternoon, and gets you 3-4 bands and ze foods. Not 100% veggie friendly last time i checked -- you'll have to stick to corn-on-the-cob, potato salad and the like. Don't leave SF w/o seeing a band here. Show up any night of the week, doesn't matter, you'll be pleasantly suprised. Garden in the back will keep smokers sated - you won't technically have to leave the bar. The crowd here is generally quite mixed and laidback, its ALL about the rock. 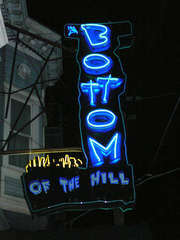 What more can be said about the Bottom of the Hill? Practically every band that's ever meant anything has played this legendary club and pretty much ever kid growing up in indie music has drooled over their show listings.